Prof Richard Jenkins, from Sheffield University, spoke to British military intelligence officers, including the head of the their “black operations” (‘black ops’ or ‘psy ops’) division, Captain Colin Wallace. 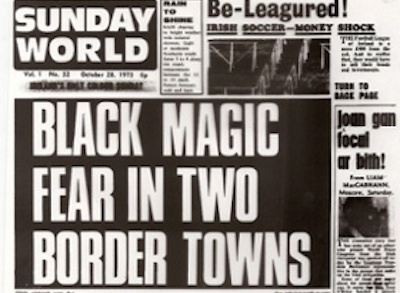 Then, British army press officers passed stories to the establishment media about black masses and satanic rituals taking place in republican areas. Wallace told Jenkins that by whipping up paranoia, they created the idea that the IRA had unleashed evil forces. “Ireland was very superstitious and all we had to do was bring it up to date,” he said. The propaganda may have had one unintended effect, however. The years 1972-74 was the era when Ulster loyalist paramilitary groups started carrying out ritualistic-style torture killings of Catholics and political opponents. One of the most notorious of these was the 1973 murder of nationalist politician Paddy Wilson and his friend Irene Andrews. The SDLP senator was shot, his throat and wrists had been cut and he had been stabbed 32 times, while Irene Andrews had been stabbed 19 times. The practice would also continue with the Shankill Butchers gang, which was active between 1975 and 1982 in Belfast, and was responsible for the brutal sectarian murders of at least 23 people.